M I C K E Y M O U S E Party! Who doesn't love Mickey! 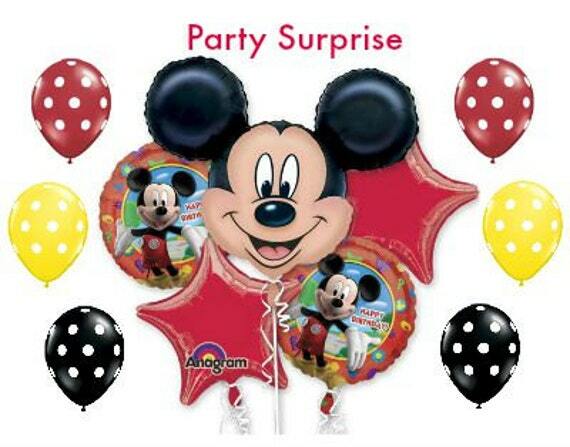 Decorate and watch the fun begin with these balloons - your kids will love them!! Choose from the mylar foil balloon bouquet - a set of 5 - along with 9 latex polka dot balloons, or just the 5 foil balloons, from the drop downs in the order box. Curling ribbon included. Don't forget your balloons, fancy straws, mini popcorn boxes, Euro gift bags, gift/favor/treat bags, tissue tassel garlands & balloon tails, custom wedding confetti wands, disposable cutlery, cake toppers, and cupcake toppers & wrappers - I have what you want! Shipping discount with multiple items.